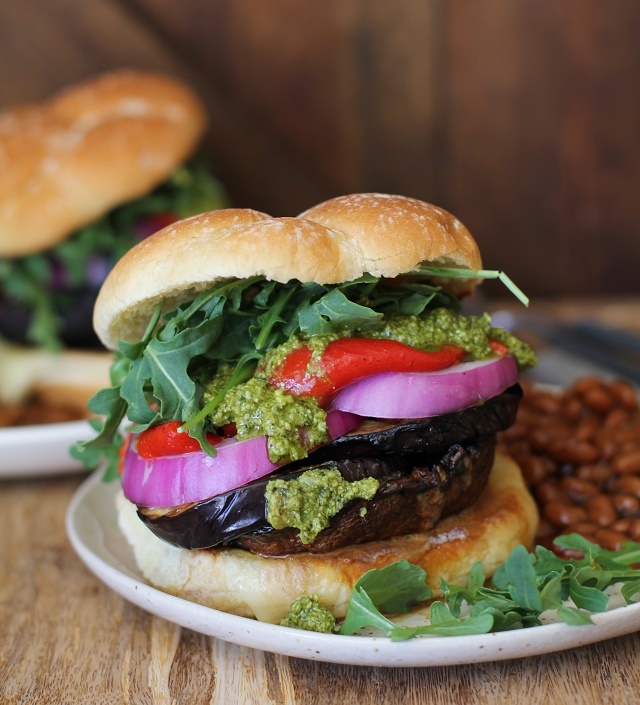 Grilled portobello mushroom burgers with grilled eggplant, roasted red peppers, red onion, arugula, and pesto sauce. The other day, I was contemplating the meaning of the veggie burger, and all of a sudden I was hit in the frontal lobe with an idea. 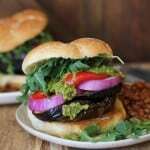 Rather than making veggie burger patties, which can be time consuming, sometimes fall apart, and require more bases than I’m willing to put out on most evenings after a long day of work, why not just make a veggie burger that is just that – veggies. No fancy patties, just some grilled (or roasted) vegetables stacked on top of each other with a funky fresh sauce. BOOM! Satisfaction. So that’s what I did. I basically put everything I could think of that goes together on this burger. I grilled up a couple portobello mushrooms and an eggplant, and topped those veggies with roasted red bell pepper (I used jarred, but you can certainly roast your own peppers if that’s your preference), red onion, arugula, and pesto sauce. I toasted up some potato buns (you can use a gluten-free bun or go bun-less) with havarti cheese to sandwich everything together. And believe you me, this thing just jives. Optional changerooskis to the burger? We’ve got plenty. 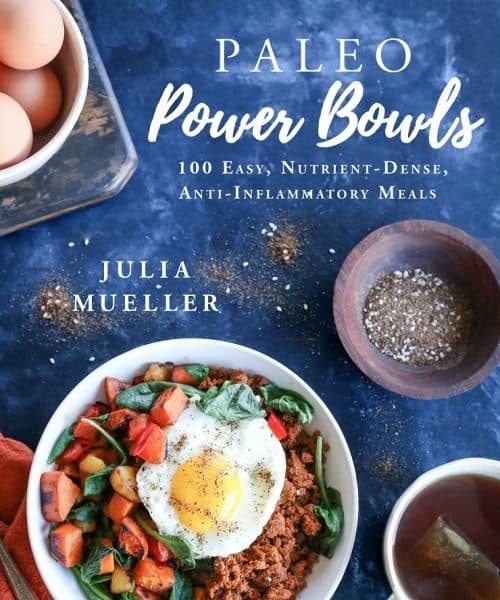 You can add sun-dried tomatoes, whip up a homemade pesto or red pepper aioli or go with a reduced balsamic drizzle, grill or caramelize the onions rather than leaving them raw, add grilled asparagus or sweet potato, replace the arugula with spinach, etc, etc, etc. Spread your veggie burger wings and flyyyy. Add the olive oil and balsamic vinegar to a small blender and blend well until smooth. Wash and pat dry the portobello caps and transfer them to a sealable container (or zip-lock bag) along with the balsamic marinade. Allow the mushrooms to marinate at least 15 minutes, up to 1 hour. Heat the grill to medium and brush the eggplant slices with olive oil and sprinkle with salt and pepper. Place the portobello mushrooms and the eggplant on the hot grill and cover. Cook until grill marks appear, about 2 to 3 minutes for the eggplant and about 5 to 7 minutes for the mushrooms. Flip and continue cooking until vegetables are juicy, tender, and cooked through, about another 2 to 3 minutes for the eggplant and 5 to 7 minutes for the mushrooms. Transfer vegetables to a plate. Toast two buns with havarti cheese (or your choice) and layer with a grilled portobello mushroom, a few slices of eggplant, roasted red bell pepper, red onion, and arugula. Drizzle on desired amount of pesto sauce and serve. This is similar to the one I have from Rachel Ray. She puts rosemary in the marinade and a red pepper pesto. I love these. Yours is much easier. I guess I’m off to the 99 cent store for Mushrooms. I’m always surprised when i find a package of two there. These look so amazing! 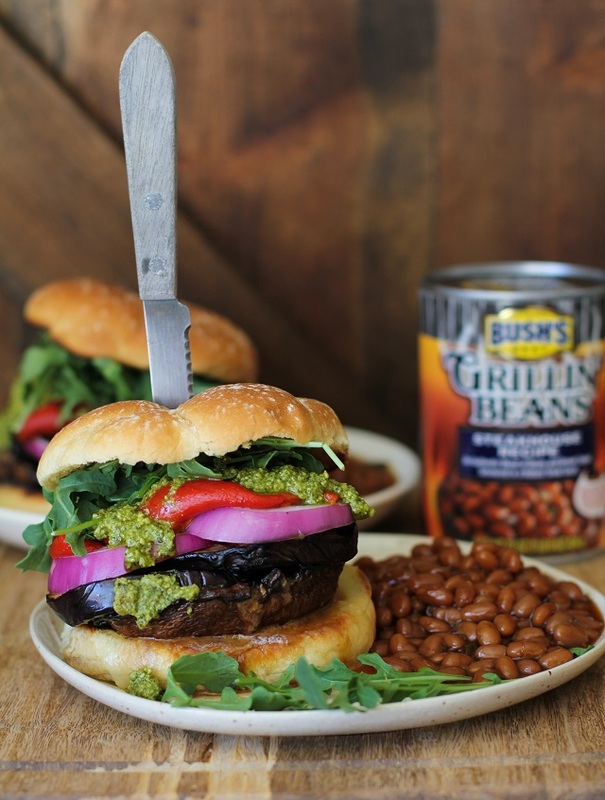 These definitely are the ultimate grilled portobello burger! Yaaaaaaaas! Oh my gosh, I haven’t eaten breakfast yet, but I WANT that burger right now! Can we make that happen over here? This burger is gorgeous! I love the drippy pesto 🙂 Pinning! This has me craving summer and grilling all the things! Portobellos and pesto belong together!